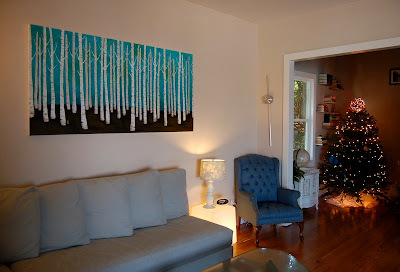 Like my husband says in this blog post, we have been hungry for original art in our home since we moved here in 2007. I was turning 30 at the end of 2009 and had been thinking of throwing a NYE party to celebrate. I was pretty set on that idea for months. However, 2 months before my birthday I had a sudden thought - instead of throwing a party, why don't we just invest in original art - it will be something that we'll have forever and something that we will cherish together. Brilliant! So I began the search. I have bookmarked dozens of artist's websites that I've admired over the years. 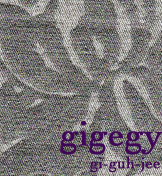 I looked through their work, went to many galleries, open studios and even trolled Etsy for a while. Nothing struck my fancy. 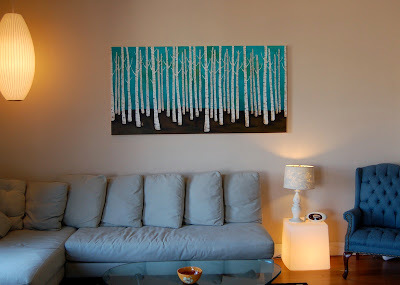 Then one day, Lisa Congdon tweeted that she has a big birch forest painting for sale. 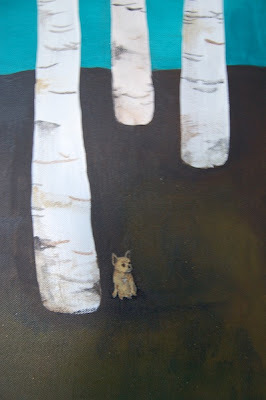 I fell in love with Lisa's birch paintings the day she first blogged about it a few years ago, I even bought a print. I mulled over it for a few days and decided to send Lisa an email to ask if we can look at it in person. She obliged and said that she'll gladly come over to our house to show it to us. I was a little scared and star struck - Lisa at our house? 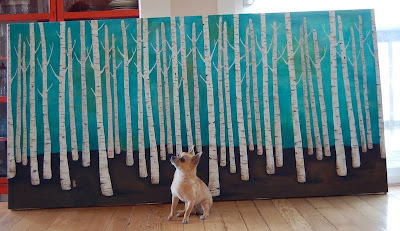 She came over that weekend with the painting. Of course we fell in love with it. What else was I expecting? We started talking about which wall the painting would go on and Phurba casually mentioned that in his dreams, we would like to put a painting up on our main living room wall. Yes, the huge wall behind the couch. One thing led to another and next thing we knew we had taken out the tape measure and started measuring. OMG this is really happening! Lisa said she's never painted anything this big but she's just waiting for someone to ask her to do so! Phurba and I didn't even have to talk it over. We looked each other in the eye and gave a nod. Yes! Yes! We'll do it! So it's now happily up on our big wall. We stared at it a whole lot the first few days. We still stare at it today. It is absolutely wonderful. Momo is in it. We love it. Thank you, Lisa! Wow, this turned out awesome!